Would You Vote Online If Given The Option For a Presidential Election? 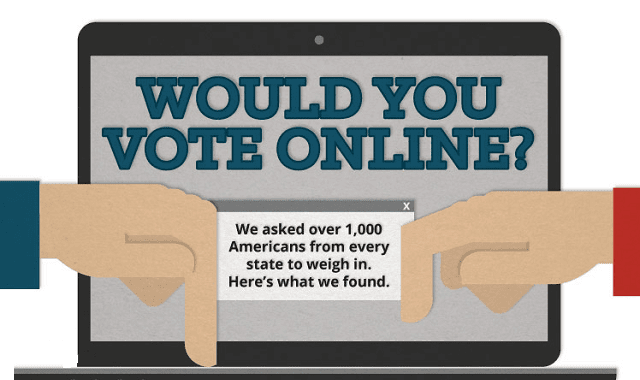 #Infographic ~ Visualistan '+g+"
Online voting is something a lot of American’s would love to be able to do for the upcoming election. More and more countries are moving the democratic process away from the traditional ballot system and towards online voting. Would you vote online if given the option? Many people would love to be able to vote online because of the ease of access. Voter turnout would also increase as a result of online voting. Soliant Consulting surveyed over 1,000 American’s from every state in the United States to see how receptive people were to voting online. They found that 78% of all respondents said they would be more likely to vote in this upcoming presidential election if given the option. Many people are already unhappy with the fact that they can’t vote already. To learn more about what American’s want from online voting, check out the survey from Soliant Consulting.